Show dates are June (2018) 1, 2, 3, 8, 9, 10, 15, 16. 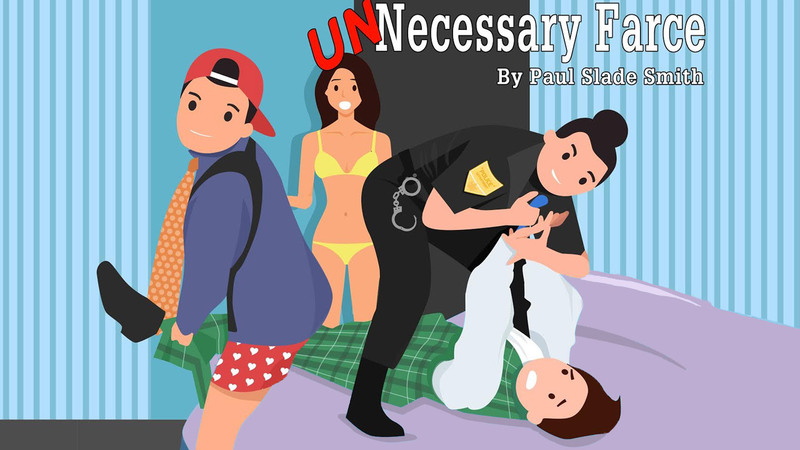 All actors who are cast must be available for all show dates, as well as tech week (Sunday, May 27th through Wednesday, May 30th) and benefit shows on weeknights throughout the run. Two cops. Three crooks. Eight doors. Go. In a cheap motel room, an embezzling mayor is supposed to meet with his female accountant, while in the room next-door, two undercover cops wait to catch the meeting on videotape. But there’s some confusion as to who’s in which room, who’s being videotaped, who’s taken the money, who’s hired a hitman, and why the accountant keeps taking off her clothes. Eric Sheridan: Male, 30s to 40s. A bookish, even-keeled police officer who’s thrown into some difficult situations — while not wearing any pants. Billie Dwyer: Female, 20s to 30s. A police officer. Eric’s partner. Although she seems to lack every skill needed for police work, she is enthusiastic and eager to succeed. Karen Brown: Female, 30s to 40s. An accountant who usually has a very professional demeanor, but seems unable to keep herself in control today. Note: the actress cast would likely be on stage in her underwear and/or a slip. Agent Frank: Male, 20s to 50s. Town Hall head of Security. Although he can seem confident and even gruff, in moments of crisis he is easily reduced to a very frightened man. Questions? Please contact the show’s director, Jim Kirkwood at jjkirkwood@verizon.net.